To Daleatron, the software takes getting used to compared to 3D software, but with enough practice you won't mind it as much. Have the taskbar begin with the filename, not 'Spriter Pro Edition'. As always, finally allow the saving and loading of the workspace! - Ability to set items as guide so they do not get exported/used in the game but can stay there to be helpful for editing. - It would be great if Spriter did not export non used sprite in the spritesheet. If there were guide, this would also not count as used in that case. 1)Make "Transform Object Properties" : Textboxes, understand arithmetic input. This will save us time from dragging the rotators for each keyframe to a desired amount of transform iteration, bringing out calculators to solve the arithmetic or making scripts. For example, if I were to multiply 5 degrees to a bone with different current angles for each keyframe in my project. I would have to use a calculator or script every time which is very inefficient. But, I could have avoided that by just copying the "arithmetic operation" for every keyframe in the textbox. And also, it would be useful to have a variable that we can use to get the 'current object transform values for each attribute'. For example, "Self.X", "Self.Y" or "Self.Angle". Besides this will be a key part for my feature request 1 & 2. 2)Transform all feature : A dialog box that brings out the common transform options, but it has the option to apply to either the "entire entity", "entire animation" or "entire keyframe". And they way it works is by selecting objects on the layout and the selected objects will be the one affected by the transformation, then after that, select the button "Transform All" and it will launch the "Transform All" dialog. This feature should be useful when the "Transform textboxes" can already understand arithmetic (Feature Request 1), because we can then now use the "Self.X", "Self.Y", or "Self.Angle". The best thing about this is it's transformation relative to each instance. 3)Transform by Inverse Kinematics. This is a need for accurate measurements. 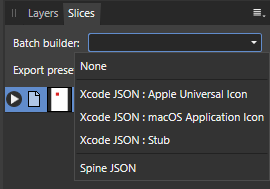 Please make Spriter receive JSON so Spriter can receive sprites directly from graphic applications and then you (Brashmonkey) talk to Affinity so they add an option inside Affinity Designer so Spriter can be part of the workflow too. Please also add first party (developed and supported by you instead of third parties) runtimes (instead of first party converters) for Unity and most used. If possible add real time editing directly from Spriter into Unity like Toon Boom does.